After my best friend, Shannon, first moved back home after our fun ‘snowboard/ski bunny’ post-college years slacking off in Breckenridge, Colorado, I visited her and she took me to eat at a place with a cuisine I had never eaten before – Lebanese. We went to Lebanese Taverna in Arlington, VA, one of six locations of this popular restaurant. After we were seated, I remember reading the history of the family-owned place on the back of their menu. It brought a tear to my eye. Ok, I’m exaggerating slightly, but I definitely started liking the place before I even ate the food. The owners, the Abi-Najm family, had a really cute ‘coming-to-America/America the land of opportunity’ story that is often unheard of these days. They fled Lebanon on a cargo ship during the civil war with only a few belongings. In 1976, they settled in Arlington and by 1979 they bought a small pizza place called Athenian Taverna and had only enough money to replace half the sign, and the first Lebanese Taverna was born. Warms your heart, right? Maybe makes you reconsider your opinions on the current immigration policy, huh? Maybe it’s just me? Anyways, that night I ate the most delicious and different meal. The dish was called Fatteh Djaje – seasoned, shredded chicken with crispy pita bread, smothered in a yogurt sauce and (my favorite part) sprinkled with pomegranate seeds. Every time I visited Shannon, I asked if we could go to Lebanese Taverna so I could satisfy my craving. After the second time dining there, I knew I had to try to find a recipe to recreate the dish. This was 1999 and the internet was shockingly different than it is today. After much searching, I found something that slightly resembled it, but I knew I would have to get creative and figure it out based on my memory of the dish at the restaurant. Pretty great description for a pretty amazing meal. I know many of you may be scared of this recipe, but if you try it once, I guarantee you’ll be hooked. Since 1999 (and one marriage to an Englishman later), I’ve grown to love lamb and eat a decent amount of it, so this recipe will be the lamb version. Feel free to substitute the lamb for chicken if you’re not a lamb eater. If you like the taste of Moroccan spices (nutmeg, cinnamon, clove, etc. ), you’ll love this meal. Season your lamb with some kosher salt, a bit of nutmeg and cinnamon. Heat up a small bit of olive oil in your pressure cooker. Over medium heat, sear your lamb until brown – about 1 1/2 minutes per side. ***NOTE: You could also slow cook the lamb in your slow cooker for 5-6 hours during the work day and still get that wonderful, falling-off-the-bone thing. Add your onions and garlic to the pressure cooker and using the leftover oil, saute briefly, stirring around the meat to make some room for the onions/garlic to cook. Make a bouquet garni (if you have cheesecloth or do what I did in a bind tonight – get a misfit (CLEAN!!) sock, cut it, wrap your spices in it and tie with kitchen twine) with the cinnamon stick, nutmeg half and cloves. After another 30 seconds or so, add your stock. Throw in your bouquet garni. Bring to a boil and follow your pressure cooker directions. Cook in pressure for 30-35 minutes. 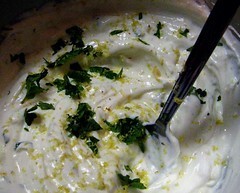 While that’s cooking, mix your strained yogurt with the garlic paste, chopped mint, squeeze of lemon and lemon zest. Stir and let sit so the flavors meld. Slice your pita and toast in the oven for about 4-5 minutes at 385 degrees till crispy. (OPTIONAL: Traditionally, the pita should be fried in butter for a more intense taste). 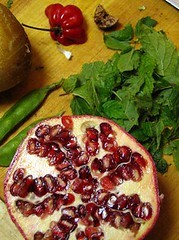 If you have a pomegranate, slice in half and remove seeds. It’s easier to submerge it in water and take seeds out that way – the little bits of sinew will separate from the seeds more easily. Strain so you just have the seeds. When lamb is finished cooking in the pressure cooker/slowcooker, using tongs, remove lamb only out of the sauce and put in bowl. Allow to cool for a few moments. Meanwhile, turn heat on medium to reduce the sauce just a bit more – about 5 minutes. After 5 minutes, add the drained chickpeas and let simmer for another 3-4 minutes. With two forks (or your fingers! ), remove the bones from the lamb meat and shred the lamb meat. It should be super tender and fall off the bone easily. Assemble your dish. Put 4-5 toasted/fried pita triangles on the bottom of your dish. 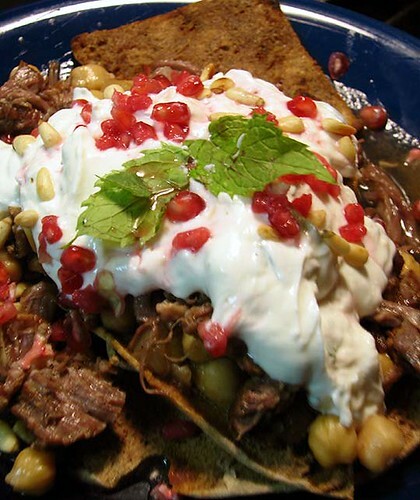 Using a large spoon, spoon some chickpeas with sauce over the crispy pita bread. You want a decent layer of chickpeas. Next, top the chickpeas with some shredded lamb. Finally, add a layer of yogurt and top with a sprinkling of pomegranate seeds, toasted pine nuts and chopped mint. Dig in! Hey! Thanks for visiting my blog — this version of the fetteh looks delicious — I tried it with chicken but never with lamb before — I will definitely have to give it a try someday. I love Lebanese Taverna — I visited the restaurant in DC and VA all the time when I lived in Washington. I love their mezzes. WOW! This is amazing. You made my Friday night. This has to be one of my all time favorite dishes. I used to live in DC, and can no longer get Lebanese food where I live. When I made this dish, it was like I back at the Lebanese Taverna. The perfume that permeates the house is fantastic. THANK YOU! Thank you, thank you, thank you brittany. this dish was made so long ago before anyone even looked at our blog and, to this day, it remains one of my favorites. we had no recipe but only our memory of the dish we ate. i thank you for trying it so you can prove that the recipe was good! i need to make this again soon… it’s healthy and it’s delicious. thank you, brittany and please stop by again!! Thank you Amy for posting this wonderful recipe. I went to Lebanese Taverna a few days ago with my husband and tried Fatteh Blahmeh for the first time, and loved it. Tonight I tried your recipe and it was a phenomenal success! You got it 100%, it tasted exactly like the other night in the restaurant. Thank you again!! This lamb recipe looks incredible. I reckon I”ll give it a whirl next week. Thank you for sharing. This was my favourite dish at Lebanese Taverna when I lived in Arlington and Alexandria, then 5 years ago I met my husband (also a Brit) married him in Breckendridge, CO. and moved to London – I’ve been subconsciously craving this for 3 years now, and was obviously guided to your blog! Thanks for this, making it tonight – mmmmmm. It’s been 15 years since I’ve been to the Taverna in Arlington – and the chicken version is what I Always got when visiting friends in D.C. I did a search with the ingredients from memory and my first result brought me to your site. Thank you, thank you! I can’t wait to make it.